Real Madrid was under pressure this Sunday night, after having seen Barcelona taking the 3 points yesterday against Rayo Vallecano. The Merengues visited Mallorca and showed their authority, leaving the home side without any chance to answer their attacking firepower, which led by Gonzalo Higuaín and Cristiano Ronaldo, with two goals each. Callejón sealed the deal close to the end, completing the classic 0-5 "manita". Mallorca hosted Real Madrid with legitimate hopes of causing an upset to the Spanish champions, but soon found out that this was a bad day to even attempt to surprise the Merengues. José Mourinho's men crushed the home side with an impressive 0-5 win, thanks to Gonzalo Higuaín and Cristiano Ronaldo braces, as well as a late goal from Callejón. The Portuguese forward reached his 11th goal in La Liga this season (18 in all competitions) and actually broke a new personal record as he now completed a 8-game streak always scoring at least one goal, for the first time in his career. Real Madrid remains 8 points below Barcelona, who will continue sharing La Liga's leadership with a surprising Atletico Madrid side. The victory started getting shape soon in the first half and the opener can actually describe a big part of the story of this game. The constant high pressure from Mourinho's men has forced the home side to commit mistakes, by giving away the ball in dangerous areas for numerous occasions. It has been precisely in one of those situations that the Merengues started setting up the play that led to the first goal of the night. Angel Di María made a little chip forward as he attempted to serve his countryman, Gonzalo Higuaín, but saw his pass being deflected in a poor touch from Mallorca's defender, Anderson Conceição. Fortunately, the ball ended up rebounding to Higuaín's feet and the Argentinian showed his undeniable flair for goal, blasting the ball into the back of the net from a powerful strike. The Merengues assault continued minutes later, with Cristiano Ronaldo showing up in the game and also finding reasons to celebrate his first goal on the night. With 22 minutes on the clock, Real Madrid quickly passed the ball around Mallorca's area, until it arrived to Cristiano Ronaldo's feet. The Portuguese star showed off his striker abilities, as he received the ball and immediatly prepared it for a strong and clean finish. The lead had just been extended and there were still no signs of Mallorca, in a game that was turning out to be easier than expected for José Mourinho. Just 3 minutes after Higuaín netted his second on the night, the Argentinian once again played a big part in the following goal and assisted Cristiano Ronaldo with a low first pass touch in a fast counter-attack. CR7 sprinted to get to the ball before any Mallorca's defenders and finished the play with an instinctive right-foot strike, beating Aouate without much trouble and setting a 4 goals lead to Real Madrid. The game wouldn't end before the Merengues reached their 5th and it happened mostly thanks to a good play and combination between Alvaro Morata and Mesut Ozil. The promising Spanish forward, who had joined the game during the course of the 2nd half, escaped his marking in Mallorca's half just before setting up Ozil with a small chip over several opponents in the defense. The German international picked it up, droved the ball towards Mallorca's goalkeeper and striked it to the far post. Callejón attacked the space in the right moment and got rewarded with an easy tap-in goal, sealing the deal for Real Madrid, with an important 0-5 win at the Ono Estadi in Mallorca. Cristiano Ronaldo is now on a 8-game streak always scoring at least one goal for Real Madrid, which sets precisely a new personal record in his career. The Portuguese forward will look forward to extend his form next Wednesday, but only if José Mourinho decides to play with the big guns, at the Copa del Rey 1st leg fixture, against Alcoyano. As usual, fans can look for official Real Madrid tickets available online at either realmadrid.com or other popular ticket stores. 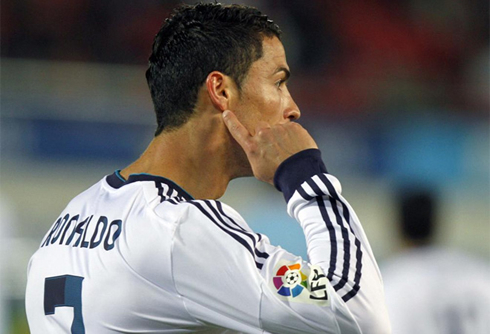 Cristiano Ronaldo next game for Real Madrid will be against Alcoyano, for the Copa del Rey, this Wednesday night (31-10-2012). You can watch Juventus live stream, Alcoyano vs Real Madrid, Alavés vs Barcelona, Chelsea vs Manchester United and Reading vs Arsenal, all matches provided from our soccer live section.